When using the Web UI, it would be great if a new item would allow you to click one button and edit the details, instead of clicking Add, then selecting the item to change the aisle, price, etc. Adam, thanks for your suggestion. This improvement is planned later this year in the Advanced Web UI feature. Thanks! I’d like to share my grocery favorites with my spouse so he can set up his phone. I created a guest account so he can pull from my cloud. After he pulls, can he remove his connection to my account? I REALLY don’t want the sharing to be permanent. We shop differently. Can I upload my aisles so he can have those? My favorites all have barcodes I’ve scanned in that belong to the local store. Will my barcodes transfer over when he loads my favorites? Does it matter if he’s in the free or the paid version? In reference to my earlier question… i know i can create a backup and then restore it to his phone and now i’ve gotten the impression through the posts that doing this would give him my barcode work, but after that is done can i remove our synched connection to my account? so he can have his own? Hi Jennifer, thank you for your questions. You may want to try “Restore from another account” command available in More –> Backup on cloud in order to transfer all data from your phone once. All your data, including barcodes, aisles, etc. will be transferred. Owner password will be required to restore backup, but it won’t get saved. Thus destination phone will not be linked to your account. Warning: all data on destination phone will be overridden by data in backup. You may also want to consider sharing only some of your lists so that you and your spouse could use the app differently. However, I understand that this may be impossible if you use a different aisle configuration. 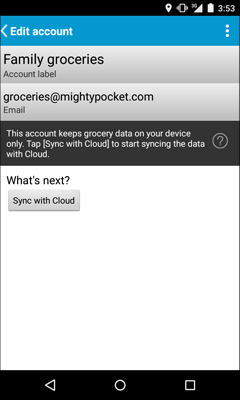 Sync with cloud feature is available in Full version of Mighty Grocery only. Therefore to have the backup restored, the app must be upgraded. Please help! I can’t seem to figure out how to get my exact favorites from one device to another. Hi Christy, thanks for your question. 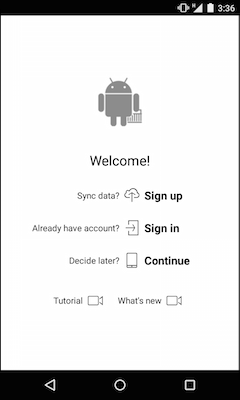 Do you need to transfer all your data from one device to another or do you need your Favorites to by instantly sync’d between two devices? – To transfer all your data, you will need to create a backup at source device and then restore backup at destination device. – To sync Favorites instantly you will need to push Favorites list to cloud from your source device and the pull Favorites list on your destination device. I keep trying to make an account and then backup with cloud but it keeps saying to make a new account. Hi Laura, thanks for your question. Do you have an Owner account listed at Menu –> Settings –> Accounts on the phone which you use for backup? Laura, thanks for the details. It must be something wrong with the app, because it should stop requesting a new account in Backup section once there is an Owner account under Accounts tab. 1. Make sure there are no records under Accounts tab by deleting them. When asked if you want to remove your account from cloud, choose No to keep it intact. 2. 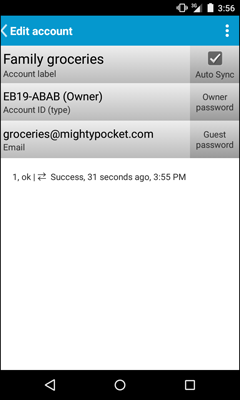 Under Accounts tab tap Login button (key) and enter your login/password. Double-check that the new record has “Owner” type. 3. Go to More tab, choose Backup on cloud. The app should not request you to create a new account. If this does not help, please contact us at hi@mightypocket.com so we could continue our investigation. Love the app. Very useful. Would really like to have some way of backing up/saving recipes. 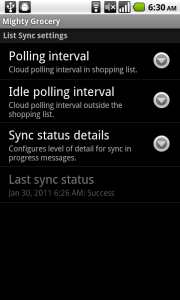 Spent considerable time adding recipes only to lose them all when my Droid X crashed. No fault of the app but disappointed to lose all that info. I have been reluctant to spend time adding recipes since. Hi Paul, thank you so much for your feedback and suggestion. I am sorry for your loss of data. Kindly note that Backup feature allows saving recipes on cloud. You just need to create account as explained above and then Create backups regularly to keep cloud data fresh. My mistake. All this time I was under the impression that a sync function and the backup function were one and the same. Thanks for the fantastic app. Just bought the app and impressed so far. I am setting up the sync, but I have noticed that the “My Picks” are not sync’d. When I try to do a manual “Sync now” a pop up says that it is “coming soon”. Any idea of the timeframe for this? I would find this very useful. If this is not working at the moment, if I add a new item to “My picks” on my phone, is there anyway I can get it onto the other phone other than adding it manually or doing a backup and restore on the other phone? I don’t want to have to keep reconfiguring settings after a restore etc. Hi Michael, thanks for your feedback and your question. Unfortunately, creating and restoring backup is the only apparent way to transfer Pick list from one phone to another. The other option is to add items from Pick list to Sync’d list and then transfer products from Automatic picks to My picks (Menu –> Settings –> Pick list –> Automatic picks –> Actions –> Move to My picks). Once this is done, items can be safely deleted from the Sync’d shopping list. Hi, I love this app! I am still trying to figure out how to use it all and get my husband’s phone list to sync with mine. Have you considered putting in a list category for Sam’s Club? We go there fairly often, and they have items there that are unavailable at other grocery stores. Thank you! Hi Deb, thank you so much for your feedback and your question. Kindly note that it is possible to add any store to the app manually. You may also want to configure aisles so that it would match the store layout. Finally, follow these instructions to get your phones in sync. I just used the Web UI and it is excellent ! 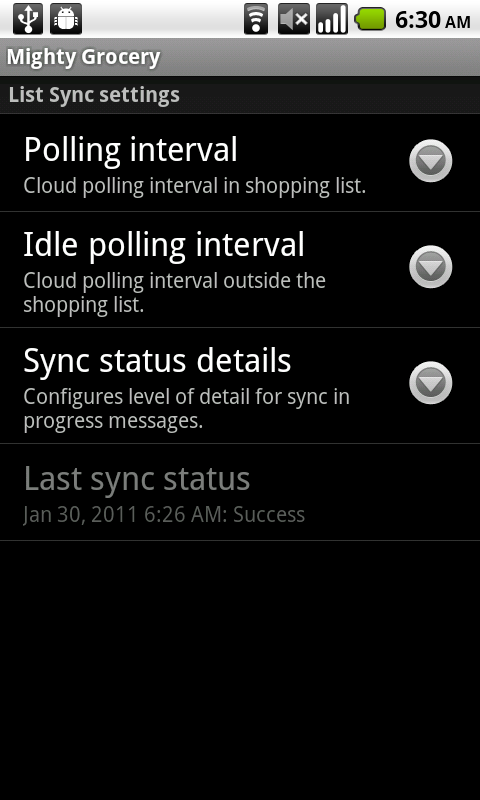 So easy to add items and they sync to my phone ! I imagine it will be a bit more detailed further down the line, but I have to say, it saved me a TON of time entering items, rather than trying to type it all in on a touch screen phone ! Keep up the good work ! P.S. I bought the app the first day I tried it and left a glowing review on Google App Market. My phone was recently run over by a car. I purchased your product before the “cloud” thing was established, and so I think somehow it assigned me a “code” on it’s own. I’m not sure of the code and the password. I’m really hoping my stuff is in the cloud someplace. Please advise. Jenna, I will be contacting you via email in order to help you restore access to your account. Hi Russ, thank you for your feedback and your question. Kindly note that it will be possible to modify shopping lists on the cloud when Basic Web UI becomes available. Follow us on Twitter to be among the first to know when Basic Web UI is open to public.